CIF San Diego Section flag waving at Qualcomm Stadium during section title games. According to East County Sports, the CIF San Diego Section Board of Managers approved a new playoff system for seven prep sports including football. Teams will now be placed in divisions based on performance instead of enrollment. Divisions one through five will remain in existence, but an Open Division will be added to house eight teams considered to be the best in the county. It will have its own playoff in which all teams automatically qualify for despite regular season performance. 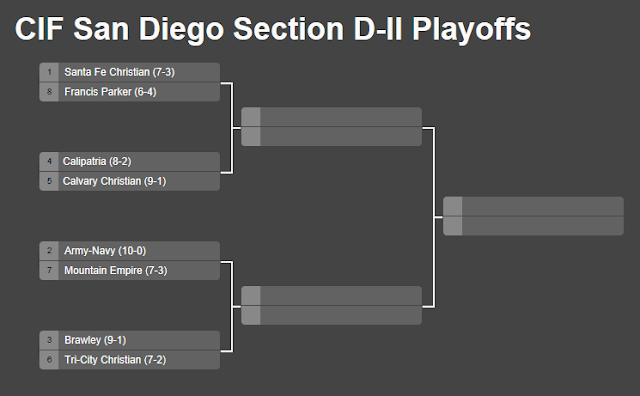 The last team standing will be crowned the CIF San Diego Section Champion. Meanwhile teams from the original divisions will have to earn the right to be "division winners" and hope its enough to move up the divisional ladder. While no system is perfect, it can't possibly be fair that only a predetermined eight teams have a chance to earn the section's most prestigious title. There has to be a better solution. Using football as an example, we came up with a proposal to make the CIF San Diego Section playoffs a more fair and exciting way to crown a true section champion. Teams can be promoted and demoted from divisions yearly based on performance. Cut the football regular season down to seven or eight games. League alignments and 8-man football remains the same. At-Large bids and seeding decided by the playoff committee on selection day. Division I & II playoff champions qualify for a possible selection to the state playoffs. The winner earns consideration for a promotion to Division I. The winner will be the undisputed best team in the county.